Sketch Pad HD is like sketching book for kids, beginners, professionals, or adults. You can create sketches or edit existing photos, drawings and then share them with social apps such as Instagram, Facebook, Twitter, Google Plus, Gmail, SMS, etc. Sketch Pad HD is a drawing tool that allows you to sketch, paint or draw with your fingers. Choose a color and brush of your choice and express yourself. Sketch Pad HD allows you to import any image via the share button in any image app. The app features a custom color selector to select the color of your choice. With Sketch App HD, you can use not only pencil and paint but sketchy, pencil, paint, shaded, chrome, fur, longfur, web, squares, ribbon, circle, grid, slinky, dashes, rectangle to draw and bring out your creative side. You can directly set your drawing as wallpaper or save it on your SD. Further, the app has two methods for zoom – Pinch to Zoom and Long-click and Swipe. You can even select the canvas size from 240×320 to 800×1280 and select the canvas orientation either as portrait or as landscape. Shake to erase is also available. The app starts with a drawing canvas itself. You can start drawing the moment app starts. You can select Pencil, eraser, etc by opening the menu. You can assign your volume up and down keys for undo and redo. When the app is closed it shows a page of other apps and then again you have to press back to exit completely. The UI design of Sketch Pad HD consists of a set of icon placed at the bottom and on the right side of the screen. The icons at the bottom deal with color and drawing tool choosing and switching to full screen. The icons at the ride side manage import, save, setting, undo and redo. The Sketch Pad HD consumes around 21 to 25 MB of ram. The app freezes sometimes. Strangely, the app requires some permission which we think is not required for a drawing app like – Your location – Fine (GPS) Location, coarse (network-based) location and Phone calls – read phone state and identity. A complete list of permissions can be found on the permissions tab here. 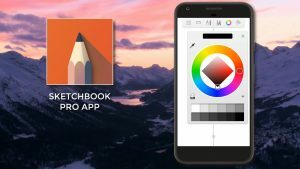 The Sketch Pad HD is free to download from Google Play. It displays ads on the top of the page which may create hassle to draw in that region. Click here to get Sketch Pad HD on Google Play.